Seagrass meadows are known to be one of the most highly productive and biologically diverse habitats on earth, so much so that they are often compared to tropical rainforests and coral reefs. They form complex habitats above and below the organically rich sediment, supporting a vast number of vertebrate and invertebrate species. For both infauna (organisms living in the sediment) and epifauna (on/above the sediment), diversity increases with increasing eelgrass shoot density (Homziak et al. 1982). Because the habitat supports so many niches (roles) for organisms, many people consider seagrass habitats to have three distinct ecosystems: subbenthic (within the substrate), benthic/demersal (bottom-dwelling), and the canopy. Very few organisms directly consume eelgrass due to its high cellulose content, but some animals are capable of doing so, including waterfowl (geese, ducks etc.) and sea turtles. Eelgrass is mostly consumed after it has broken down into individual particles of organic matter knows as detritus. Infaunal organisms thrive in the sediment, protected by the densely entangled roots and rhizomes and provided with ample eelgrass detritus. For example, in a Virginia eelgrass meadow, infaunal densities reached 51,343 individuals/square meter compared to 1771 ind./sq m in nearby non-vegetated areas (Orth 1977). Detritus not only supports organisms within the eelgrass system, but eelgrass detritus can be exported long distances and has been found to support offshore habitats thousands of feet below the surface. Dead and decaying leaves are slowly decomposed by microscopic bacteria and fungi, providing organic matter for infaunal worms and crustaceans. Larger consumers like fish and crabs feed on these detrivores, which are in turn eaten by even larger predators. This is known as a detrital food web. 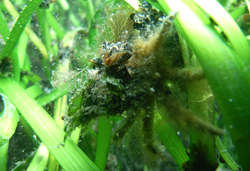 The surface of eelgrass blades form attachment sites for epiphytes (learn more...) and invertebrates including diatoms, macroalgae, sponges, barnacles, bivalves and tube building worms. Algal epiphytes are directly consumed by grazers (learn more...) like snails and sea slugs. The community of epiphytes and grazers within an eelgrass canopy is considered a distinct ecosystem similar to the rain forest tree canopy, rarely coming into contact with the sea floor. Other species do venture into the canopy for protection and food including juvenile bay scallops (learn more...). Some small crabs, like mud crabs and decorator crabs (juv. spider crabs), are light enough to climb the grass blades and take advantage of food sources in the canopy. 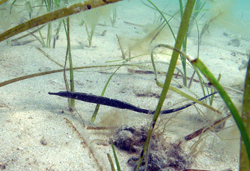 The fauna of seagrass beds tends to be made up of small, cryptic (blend into their environment) species and juveniles of larger species (Jenkens et al. 1997b). Here on Long Island, eelgrass is considered the preferred habitat of sticklebacks, pipefish, seahorses, and bay scallops. 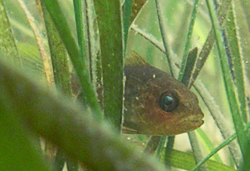 Juvenile and adult fish species frequenting our eelgrass meadows include fluke, flounder, bluefish, striped bass, porgy, tautog (blackfish), black sea bass, sea robins, sculpins, cunner, and puffer fish. 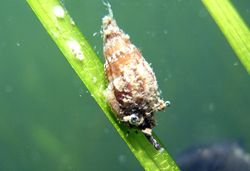 Larvae such as those of clams and scallops settle into eelgrass meadows due to the dampening affect the eelgrass has on water movement (tidal currents and waves), and these bivalves benefit not only from reduced predation pressure but also high concentrations of particulate food (Peterson et al. 1984). 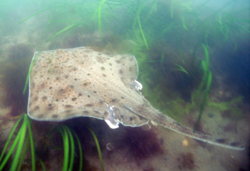 Other commercially important species such as squid and lobster also take advantage of eelgrass habitat (Learn more…). Homziak, J., M.S. Fonseca, and W.J.Kenworthy. 1982. Macrobenthic community structure in a transplanted eelgrass (Zostera marina) meadow. Mar. Ecol. Prog. Ser. 9: 211-221. Orth, R.J. 1977. The importance of sediment stability in seagrass communities, p. 281-300. In B.C. Coull (ed. ), Ecology of Marine Benthos. Univ. of South Carolina Press, Columbia. Orth, R.J., K.L. Heck and J. Van Montfrans. 1984. Faunal communities in seagrass beds: a review of the influence of plant structure and prey characteristics on predator-prey relationships. Estuaries 7:339-350. Peterson, C.H., H.C. Summerson, and P.B. Duncan. 1984. The influence of seagrass cover on population structure and individual growth rate of a suspension feeding bivalve, Mercenaria mercenaria. J. Mar. Res. 42: 123-138.